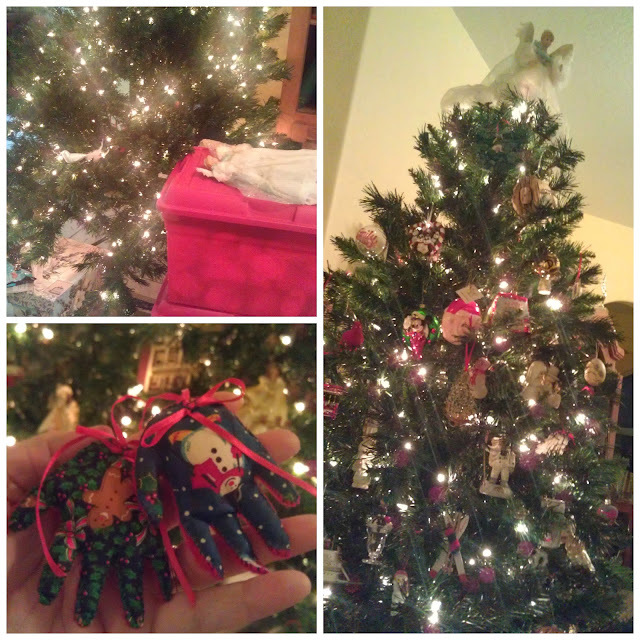 We finally put ornaments on the tree yesterday. After church, and between a late birthday lunch, a nap and a trip to Outdoor World. When Eric went out to get the boxes, and asked what else? I said that's it. I hoped that the stockings were in the top of one of the ornament boxes, and was relieved when they were. Just for fun, he dug down into the next box, to see if there was something easy to bring out... and he pulled out our tree top angel. I thanked God for the easy find, and was reminded that He takes care of even the smallest details. It is the story I love, and long to hear, again and again. Messy. Marvelous. And so full of Wonder. Still. I'm so thrilled that you have made so much progress and now...now it is time to enjoy; and breathe it all in. Oh, and I am privy to what brought on that daytime nap....party animal!! He's good like that. The tree is beautiful. A slow and easy Christmas is calling my name, too. The description of the kids on the floor and using the hook made me laugh. It's always the way with littles, right?